I have always been a fan of hummus but didn’t really know what to put it on. I was trying different things but I though about what would be the healthiest so I was testing out veggies and the best veggie in my opinion that taste great with hummus is Celery. Celery is a great vegetable for fiber, vitamin A and C. Celery is also low in calories. Some other vegetables that taste great with hummus as tomatoes, mushrooms, cucumbers and carrots. Try them out today and become one step closer to living a healthier lifestyle! I love hummus with broccoli! I am also enjoying a new hummus made out of edamame beans. That’s awesome. Do you make the hummus yourself? No, but I have made it (the regular type). what about with cassava and java sweet potato? We love hummus and use it as a dip for chips and veggies and as a sandwich spread. It’s soooo cheap and easy to make but I rarely buy tahini so we usually sub peanut butter instead. One of my newer favorite hummus recipes is this pizza hummus: http://chocolatecoveredkatie.com/2012/01/30/melty-pizza-hummus/. I also bookmarked a recipe for avocado hummus – http://www.candcmarriagefactory.com/2010/08/avocado-hummus.html – which is on my list to make. Thank you so much Karla for the link to the avocado recipe. I am always looking to try different flavors of hummus. Youre awesome! That kind of hummus is awesome! I eat it all the time. I’m not sure how you eat in the carb department but it is really good with Triscuts also. I love hummus on carrot sticks and also cucumber – or actually just anything! It’s so, so tasty. Have you ever tried making your own? Had some at a wedding last weekend and it was incredible! Never made my own hummus but I would like to start. It should be pretty easy. We need that rule in Florida lol. OMG…I just had Pine Nut Hummus on celery about half an hour before I read this. It’s taken me awhile to even eat celery for texture reasons, but I’ve found I enjoy it with a little bit of Nancy’s Organic Cream Cheese and grapes. 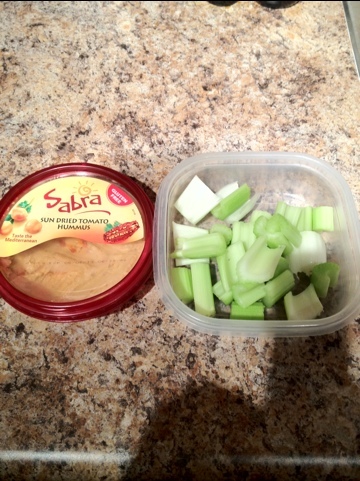 I put hummus inside the celery like I used to do with cheez whiz growing up. It’s really easy to make as long as you have a food processor. You just add your chick peas, a little water or tahini, and whatever flavour you want. My two favourite flavours and the ones that I take to parties are roasted red pepper & wasabi 🙂 oh and I just remembered about my jalapeno hummus. I used it today as a spread for my lettuce wraps. Have you tried it with jicama? My favorites are celery, carrots, and jicama. All three have the crunch I crave in the afternoon, and the hummus provides some protein to get me through my karate workouts! Thank you so much for visiting me! This post has made me so hungry! I use the same brand Hummus and love it! I have some in the fridge now and cut up veggies…including celery! thanks for putting this out there!! Love your site! LJayHealth, celery (although I absolutely HATE it) is a great snack choice for people who are trying to cut calories as it is technically a ‘negative calorie’ food. It costs more energy to eat it than you earn from eating it! Good choice having it with hummus, a much better dip idea than ranch or anything else. I haven’t bothered to use hummus that much in the past, but I think it is an excellent idea to use as a dip for a snack. I’ve been basically using hummus to thicken up my soups because I don’t use the flour or the other thickenings . Yes! I actually look forward to having this snack haha. Good job on replacing the flour with the hummus in your soup. I will have to try that out! Nice! Sounds good. It’s tough to find really good vegan restaurants in Florida. LJay, hummus is soooo easy to make at home! that way you’re sure there are no hidden yuckies in your snack. Pour 1 tin of chick peas – drained, but keep the water – in a blender. Add as much garlic as you like, the juice of 1 lemon and 2 tblspoons of tahini (sesame seed paste). Blend it all up as thick or smooth as you like adding some of the reserved water to make it to your preferred texture. If you want it a little more “fancy”, just add as you wish grilled peppers, sundried or fresh tomatoes, fresh basil, a little harissa paste to make it spicy…. the choices are unlimited. Thank you for this! I know that I should probably prepare hummus myself but I guess I find it easy to just go to the store and buy it :). Im going to use your recommendation and make my own hummus this weekend. Thanks again for the feedback!